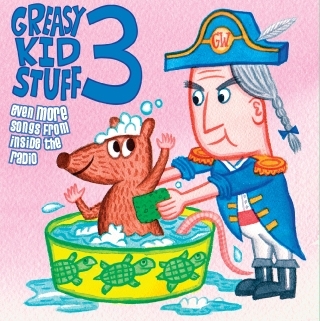 Our latest release: "Greasy Kid Stuff 3: Even MORE Songs From Inside The Radio"
$10.99 postpaid to the USA! CLICK HERE for a piece from THE NEW YORK TIMES! CLICK HERE for a piece from Oregon Live. CLICK HERE to read the review of GKS3 at Zooglobble! CLICK HERE to read an interview with Belinda Miller on the NW Kids site! CLICK HERE for the official Greasy Kid Stuff Show Blog! CLICK HERE to see the Greasy info on the KNRK 94.7fm Portland site! CLICK HERE to see a nice piece from The Oregon Music News! CLICK HERE for a nice CD review from L.A. Parent.